The excitement is building for athletes as the first horses arrive at Greenwich Park in preparation for the Olympic equestrian events at London 2012. 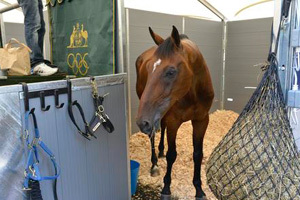 The equine athletes’ trunks of equipment must undergo the equivalent of the airport-style “mag and bag” checks done on every person attending the Olympic Games. This has been done for the first 75 of 219 Olympic horses who have been through the specially constructed Equine Staging Facility (ESF) at Greenwich University over the past two days and all are now settled into their temporary new home. The truck driver and passengers go through the normal screening processes, and they are allowed two pieces of hand baggage per person, all of which has to be scanned. Once the interior of the horse transporter has been screened, which takes about 20 minutes, the horses are reloaded, and the ramps and doors are then security sealed with tape from the outside. This is just a security measure, and the ramp and the doors can be opened in an emergency. Once in their new homes, the horses then have a more complete health check which is carried out by the FEI Veterinary Commission, when the horses’ passports are checked to see that their markings match its passport. There are no photographs in equine passports, just a standard line drawing on which the horse’s unique identifying features, such as white marks, are noted. The passport also gives an up-to-date listing of all vaccinations administered to the horse. Over the next couple of weeks, horses from 40 countries on six continents will be staying in Greenwich Park for the Olympic equestrian events, with 54 coming in for the dressage and 90 for the jumping after the eventing horses have finished their competition. Busiest day of all will be August 1, when no fewer than 39 lorries and 88 horses will go through the ESF en route to Greenwich. And a further 78 horses will be on site during the Paralympic Games. The stables, which are the equine equivalent of the Athletes Village in the Olympic Park, are all raised off the ground to protect the Greenwich Park grassland. There are 200 stable units in total, each one measuring 3.5 x 4 metres. There are also wash boxes, so the horses can have a shower after exercise or post-competition. And, if there’s a need for any veterinary assistance, there is a purpose-built 24-hour veterinary clinic on site. A world-class team of equine veterinary experts is in place at London 2012 to safeguard horse health and provide the best possible care and attention to the equine athletes during the Games. As well as the London 2012 Veterinary Services team, the horses competing at Greenwich Park will be accompanied throughout the Games by their own personal and team veterinarians. It is not over-stating it to say that the horses are probably the most pampered athletes in the entire Games.